Red Oak is a fast growing oak, our irrigated Red Oaks have put on 5' of growth in some years, maturing with a broad round crown, leaves are 4-8 inches long, deeply indented, shiny dark green above turning a red or brown in fall. Red Oak acorns are 3/4-1" long, mature in two years. This oak tree will tolerate a wide range of soils and is an excellent lumber tree and transplants fairly easily if grown in root bags. 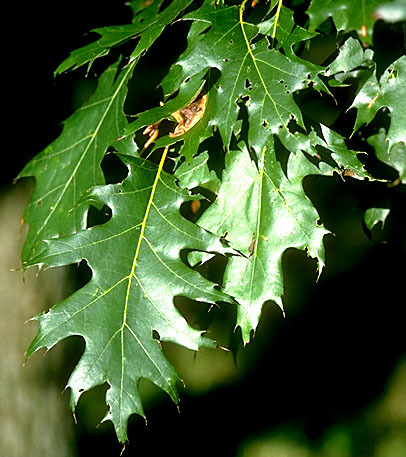 Red Oak is moderately drought tolerant, prefers sandy loam, well drained and a touch on the acid side. It can tolerate medium shade and self prunes well to grow tall clear stems. Red Oak can withstand polluted air, full sun and should be planted more as it is a good landscape tree. Some of you may have wished you could live in a house made of chocolate cake. Any time you desired something to eat, you might merely nibble off a piece of cake off the nearest wall. There are in the world of creatures just about as nicely settled so far as their eats are concerned as you would be if you lived in a chocolate cake house. The house in which these creatures live are even better than one of chocolate cake, because they are weather proof and able to protect their tenants from rain, snow, cold and even some of their enemies. The more they chew their house the bigger it becomes. Many sorts of creatures live in these home made houses. The homes are called galls. If one were to open the gall in winter they would find a little grub that can be used for ice fishing. Normally these galls do no serious danage to red or other oaks. Gypsy moth can de-leaf an entire Oak forest and is a major pest of all oaks. The red oak wood is used for flooring, paneling, furniture and construction. Red Oak is found through all of Michigan. In Michigan the red oak can attain a height of 90 feet and a diameter exceeding 24 inches. 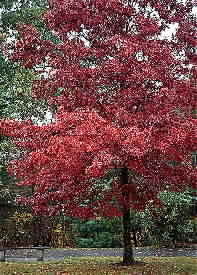 The Red Oak is native to the following states: From new England to Minnesota, south to Louisiana to Georgia. Many of the native and non-native where these trees grow have a multitude of tree nursery outlets to choose from as well as many tree farm grown selections. We also have: Burr English Oak, English Oak, Willow Oak, Chestnut Oak, Columnar English Oak, Shumard Oak, White Oak , Swamp White Oak , Northern Red Oak, Heritage Oak, Regal Prince Oak, Rocky Mountain White Oak, Pin Oak , Oregon White Oak, Burr Gambel Oak, Scarlet Oak, Sawtooth Oak, Northern Pin Oak, Bur Oak , and Chinkapin Oak. Other great evergreens in our selection include a wide variety of pine tree species. Among our most popular is the beautiful White Pine tree , available in seedling all the way to full matured trees. Click the blue prices link below for our hardwood price sheet. Our 5-6 foot Red Oak are too large to ship UPS and must come motor freight at an extra charge. To order Red Oak seedlings by PHONE: We're glad to take your order by phone. For your convenience, we have a toll free number 800 568-9179. Phone orders can be charged to VISA, or MasterCard accounts. Shipping & Handling: Most orders are shipped UPS. Make sure we have your street address and a daytime phone number. Please include 20% shipping and packaging with your order.